Donald A.B. Lindberg, MD, who retired as National Library of Medicine Director March 31 after more than 30 years, has been recognized by the United States uniformed services with two prestigious medical honors. On Saturday, May 16, Dr. Lindberg was presented with an honorary Doctor of Humane Letters degree during the Uniformed Services University of the Health Sciences 36th commencement exercise at the Daughters of the American Revolution Constitution Hall in Washington, DC. The honorary degree recognizes Dr. Lindberg’s outstanding leadership in bioinformatics and his decades of public service. Donald Lindberg recognized that the profound changes in American society and healthcare which occurred in the last third of the 21st Century made top down medicine a relic of the past. His visionary leadership, uncanny judgment, administrative courage and perseverance have resulted in free, robust internet access to vast quantities of trusted consumer health information, published biomedical knowledge, chemical and drug information, clinical trial and scientific data that are used every day by millions of people across the nation and around the world. This information has empowered the citizens of [a] representative democracy to make informed decisions about their own care, as well as the role of medicine in our society for the 21st Century. The degree to which the next generation continues to support public biomedical research will in large measure be the result of this leadership and commitment which empowered the citizenry. Dr. Donald A.B. 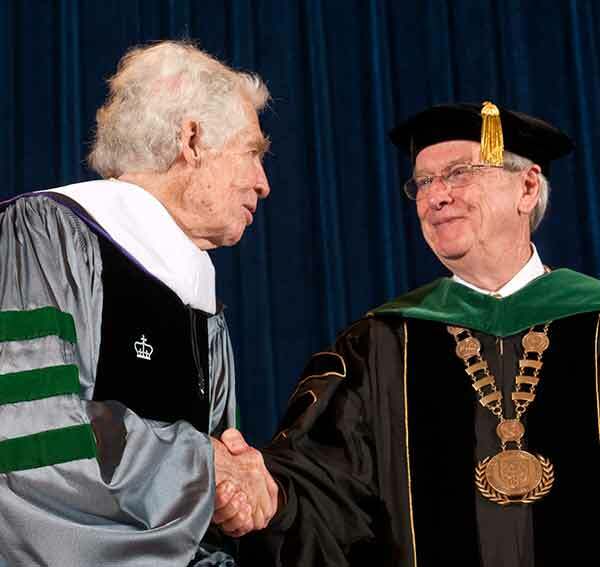 Lindberg (left) receives an Honorary Doctorate from Dr. Charles Rice (right), President of the Uniformed Services University of the Health Sciences. At a March 30, 2015 National Institutes of Health program saluting his distinguished career as National Library of Medicine Director, Dr. Lindberg was awarded the US Army Order of Military Medical Merit. Colonel Cathy Nace, MD, Director of Medical Education for the Army, made the presentation. Before reading the official award citation, Col. Nace thanked Dr. Lindberg on behalf of the entire Army for his many achievements, noting that this award is rarely bestowed upon civilians. 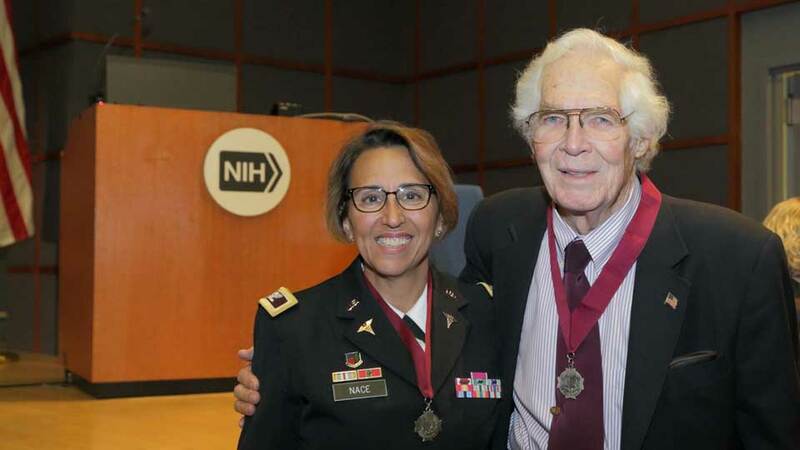 She highlighted Dr. Lindberg’s pioneering work at NLM in support of the Army Medical Department and the resulting improvements to “the education and clinical practices of health care providers, Army military health systems and caregivers worldwide, and the care of the American warrior. With a nod toward history, Col. Nace noted that Dr. Lindberg was only the second civilian director of the Library, which traces its lineage to the Library of the Surgeon General of the Army, founded in 1836. In fact, NLM remained part of the military until 1956, when Congress officially designated it the National Library of Medicine and transferred it to the National Institutes of Health. Be it known that the President of the Order of Military Medical Merit by virtue of the authority vested in her and upon the recommendation of the Advisory Council, confers honorary membership in the Order of Military Medical Merit on Donald A.B. Lindberg, MD, who through dedicated applications of talent, effort and spirit has made significant exemplary contributions to the United States Army Medical Department. The US Army Order of Military Medical Merit, also known at O2M3, is an Army-based but separate organization established to recognize excellence and promote fellowship and esprit de corps among Army Medical Department personnel. Colonel Cathy Nace, Director of Medical Education, U.S. Army, shares a moment with then-National Library of Medicine Director Dr. Donald A.B. Lindberg, who is wearing the US Army Order of Military Medical Merit medallion she just presented to him. June 4, 2015 in People.